Celebrating the 150th Birth Anniversary of Swami Vivekananda, Ramakrishna Mission Laitumkhrah Shilong, introduced ‘Value education’ in different standards in different schools in the last academic session(2013-2014). 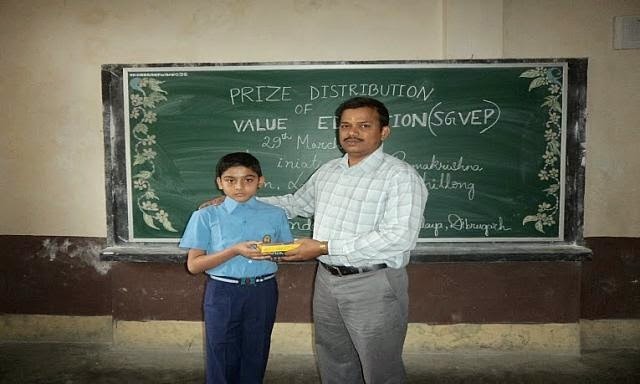 Our School, VKV-Dibrugarh has got the opportunity to conduct Value Education class in sixth standard(in both sections). The project has given the chance to choose three toppers from each class on the basis of their performance throughout the year. Prizes are distributed in the presence of our respected Vice Principal. We congratulate them for their efforts in taking Value Education successfully. Hope this programme will be successful in implementing positive values in the children.